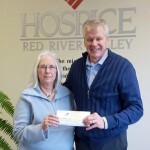 Barbara Ziegler, owner of Barb & Friends Unique Gifts in Hope, N.D., generously donated the 2015 proceeds from the sales of the homemade scrubbies and dish clothes from her store to Hospice of the Red River Valley. Barb shared: “I wanted to pick something that was dear to my heart. When I told people that the sales of the scrubbies and dish clothes would go to your organization, they were very generous and pleased. Even though I donate the scrubbies, I would like to acknowledge Pat Slade, who donates the dish clothes. My first encounter with hospice was in 2003, in Arizona. My mother was in failing health. I went and spent the last two weeks of her life with her and saw what a blessing the hospice nurse was to my mother. I will never forget the peace on my mother’s face toward the end. Thank you, Barb, for your support and generosity!